PrestaShop 1.6 There are 7 products. Product Properties Extension compatible with PrestaShop version 1.6.0.5. 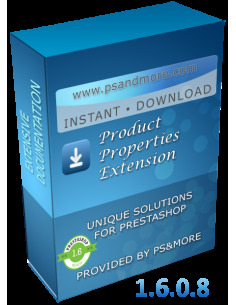 Product Properties Extension compatible with PrestaShop version 1.6.0.6. Product Properties Extension compatible with PrestaShop version 1.6.0.8. 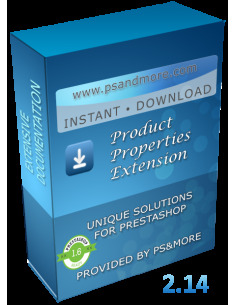 Product Properties Extension 2.14 compatible with PrestaShop version 1.6.0.14. Product Properties Extension 2.36 compatible with PrestaShop versions 1.6.1.0, 1.6.1.1, 1.6.1.2, 1.6.1.3, 1.6.1.4, 1.6.1.5, 1.6.1.6, 1.6.1.7, 1.6.1.8, 1.6.1.9, 1.6.1.10, 1.6.1.11, 1.6.1.12, 1.6.1.13, 1.6.1.14, 1.6.1.15, 1.6.1.16, 1.6.1.17, 1.6.1.18, 1.6.1.19, 1.6.1.20, 1.6.1.21, 1.6.1.22 and 1.6.1.23.